Professor Chris Hammond BA MA BM BCh MRCP (UK) FRCOphth MD is Frost Chair of Clinical Ophthalmology at King’s College London and an NIHR (National Institute for Health Research) Senior Research Fellow studying the genetics of common age-related eye diseases. Based in KCL’s Department of Twin Research and Genetic Epidemiology at St Thomas’ Hospital, London, he has also performed twin studies to examine the heritability of macular pigment, dry eye, and pupillary responses. 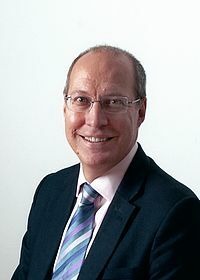 As a member of the TwinsUK Resource Executive Committee, he is involved in the management, planning and use of the TwinsUK cohort (PI Prof Tim Spector). Chris has over 90 publications to his name, including four book chapters. He is also a practising ophthalmologist with a special interest in adult strabismus, and paediatric ophthalmology. After obtaining his BA from Cambridge University and BM BCh from the University of Oxford in 1988, Chris trained in General Medicine in Oxford and Stoke on Trent. His ophthalmology training was started at the Sussex Eye Hospital, Brighton, and Addenbrooke’s Hospital, Cambridge, and he was Registrar at the Western Eye Hospital, Senior Registrar at St Thomas’ Hospital and Fellow at Moorfields Eye Hospital, London. He spent ten years as Consultant Ophthalmologist at Princess Royal University Hospital, Orpington, before being appointed to a chair at King’s College London. Chris was awarded an MD by the University of London in 2000. Reviewer for numerous journals, including Nature Genetics, American Journal of Human Genetics, Investigative Ophthalmology and Vision Science, Ophthalmology, Ophthalmic Epidemiology, Clinical and Experimental Ophthalmology, American Journal of Ophthalmology, Eye, British Journal of Ophthalmology, Human Molecular Genetics. Verhoeven VJ, Hysi PG, Wojciechowski R, Fan Q, Guggenheim JA, Höhn R, MacGregor S, Hewitt AW, Nag A, Cheng CY, Yonova-Doing E, Zhou X, Ikram MK, Buitendijk GH, McMahon G, Kemp JP, Pourcain BS, Simpson CL, Mäkelä KM, Lehtimäki T, Kähönen M, Paterson AD, Hosseini SM, Wong HS, Xu L, Jonas JB, Pärssinen O, Wedenoja J, Yip SP, Ho DW, Pang CP, Chen LJ, Burdon KP, Craig JE, Klein BE, Klein R, Haller T, Metspalu A, Khor CC, Tai ES, Aung T, Vithana E, Tay WT, Barathi VA; Consortium for Refractive Error and Myopia (CREAM), Chen P, Li R, Liao J, Zheng Y, Ong RT, Döring A; Diabetes Control and Complications Trial/Epidemiology of Diabetes Interventions and Complications (DCCT/EDIC) Research Group, Evans DM, Timpson NJ, Verkerk AJ, Meitinger T, Raitakari O, Hawthorne F, Spector TD, Karssen LC, Pirastu M, Murgia F, Ang W; Wellcome Trust Case Control Consortium 2 (WTCCC2), Mishra A, Montgomery GW, Pennell CE, Cumberland PM, Cotlarciuc I, Mitchell P, Wang JJ, Schache M, Janmahasathian S, Igo RP Jr, Lass JH, Chew E, Iyengar SK; Fuchs' Genetics Multi-Center Study Group, Gorgels TG, Rudan I, Hayward C, Wright AF, Polasek O, Vatavuk Z, Wilson JF, Fleck B, Zeller T, Mirshahi A, Müller C, Uitterlinden AG, Rivadeneira F, Vingerling JR, Hofman A, Oostra BA, Amin N, Bergen AA, Teo YY, Rahi JS, Vitart V, Williams C, Baird PN, Wong TY, Oexle K, Pfeiffer N, Mackey DA, Young TL, van Duijn CM, Saw SM, Bailey-Wilson JE, Stambolian D, Klaver CC, Hammond CJ. Genome-wide meta-analyses of multiancestry cohorts identify multiple new susceptibility loci for refractive error and myopia. Nature Genetics. 2013 Mar; 45(3): 314-8. Hammond CJ, Liew SM, Van Kuijk FJ, Beatty S, Nolan JM, Spector TD, Gilbert C. The Heritability of Macular Response to Supplemental Lutein and Zeaxanthin: a Classical Twin Study. Invest Ophthalmol Vis Sci. 2012 Jul 26; 53(8): 4963-8. Hysi PG, Simpson CL, Fok YK, Gerrelli D, Webster AR, Bhattacharya SS, Hammond CJ, Sham PC, Rahi JS. Common polymorphisms in the Serpini2 gene are associated with Refractive error in the 1958 British birth cohort. Invest Ophth Vis Sci. 2012 Jan 25; 53(1): 440-7. Suhre K, Shin SY, Petersen AK, Mohney RP, Meredith D, Wägele B, Altmaier E; CARDIoGRAM, Deloukas P, Erdmann J, Grundberg E, Hammond CJ, de Angelis MH, Kastenmüller G, Köttgen A, Kronenberg F, Mangino M, Meisinger C, Meitinger T, Mewes HW, Milburn MV, Prehn C, Raffler J, Ried JS, Römisch-Margl W, Samani NJ, Small KS, Wichmann HE, Zhai G, Illig T, Spector TD, Adamski J, Soranzo N, Gieger C, Assimes TL, Deloukas P, Erdmann J, Holm H, Kathiresan S, König IR, McPherson R, Reilly MP, Roberts R, Samani NJ, Schunkert H, Stewart AF. Human metabolic individuality in biomedical and pharmaceutical research. Nature. 2011; 477: 54-60. doi: 10.1038/nature10354. Sanfilippo PG, Medland SE, Hewitt AW, Kearns LS, Ruddle JB, Sun C, Hammond CJ, Young TL, Martin NG, Mackey DA.Ophthalmic Phenotypes and the Representativeness of Twin Data for the General Population. Invest Ophthalmol Vis Sci. 2011 Jul 29; 52(8): 5565-72. Mells GF, Floyd JA, Morley KI, Cordell HJ, Franklin CS, Shin SY, Heneghan MA, Neuberger JM, Donaldson PT, Day DB, Ducker SJ, Muriithi AW, Wheater EF, Hammond CJ, Dawwas MF; The UK PBC Consortium; The Wellcome Trust Case Control Consortium 3, Jones DE, Peltonen L, Alexander GJ, Sandford RN, Anderson CA. Genome-wide association study identifies 12 new susceptibility loci for primary biliary cirrhosis. Nat Genet. 2011; 43: 329-332. Nica AC, Parts L, Glass D, Nisbet J, Barrett A, Sekowska M, Travers M, Potter S, Grundberg E, Small K, Hedman AK, Bataille V, Tzenova Bell J, Surdulescu G, Dimas AS, Ingle C, Nestle FO, di Meglio P, Min JL, Wilk A, Hammond CJ, Hassanali N, Yang TP, Montgomery SB, O'Rahilly S, Lindgren CM, Zondervan KT, Soranzo N, Barroso I, Durbin R, Ahmadi K, Deloukas P, McCarthy MI, Dermitzakis ET, Spector TD; The MuTHER Consortium. The Architecture of Gene Regulatory Variation across Multiple Human Tissues: The MuTHER Study. PLoS Genet. 2011 Feb 3; 7(2):e1002003. Macgregor S, Hewitt AW, Hysi PG, Ruddle JB, Medland SE, Henders AK, Gordon SD, Andrew T, McEvoy B, Sanfilippo PG, Carbonaro F, Tah V, Li YJ, Bennett SL, Craig JE, Montgomery GW, Tran-Viet KN, Brown NL, Spector TD, Martin NG, Young TL, Hammond CJ, Mackey DA. Genome-wide association identifies ATOH7 as a major gene determining human optic disc size. Hum Mol Genetics. 2010; 19: 2716-24. Hysi PG, Young TL, Mackey DA, Andrew T, Fernández-Medarde A, Solouki AM, Hewitt AW, Macgregor S, Vingerling JR, Li YJ, Ikram MK, Fai LY, Sham PC, Manyes L, Porteros A, Lopes MC, Carbonaro F, Fahy SJ, Martin NG, van Duijn CM, Spector TD, Rahi JS, Santos E, Klaver CC, Hammond CJ. A genome-wide association study for myopia and refractive error identifies a susceptibility locus at 15q25. Nature Genetics. 2010; 42: 902-905. Solouki AM, Verhoeven VJM, van Duijn CM, Verkerk AJMH, Ikram MK, Hysi PG, Despriet DDG, van Koolwijk LM, Ho L, Ramdas W, Czudowska M, Amin N, Struchalin M, Aulchenko YS, van Rij G, Isaacs A, Kuijpers RWAM, Young TL, Mackey DA, Spector TD, Swagemakers SMA, van Oosterhout AALJ, Oostra BA, Rivadeneira F, Uitterlinden AG, Hofman A, de Jong PTVM, Hammond CJ, Vingerling JR, Klaver CCW. A genome-wide association study identifies a susceptibility locus for refractive errors and myopia at 15q14. Nature Genetics. 2010; 42: 897-901.